Association Croquet can be played as a singles event to show-case individual competitive brilliance, or as a doubles match. The Eire Cup differs from most tournaments in being team focused, featuring both singles and double matches, with a three hour time limit on each game. The six states nominate a team of eight, four men and four women, but with an extra woman player to share the work load. The Eire Cup provides Australia’s top players with the honour of playing representative croquet for their state. It is the most populous states of NSW and Victoria that usually carry off the trophy, and this year it was NSW with the home ground advantage. Male Team: Simon Hockey (Captain), Harley Watts, Dwayne McCormick, Greg Rowberry. 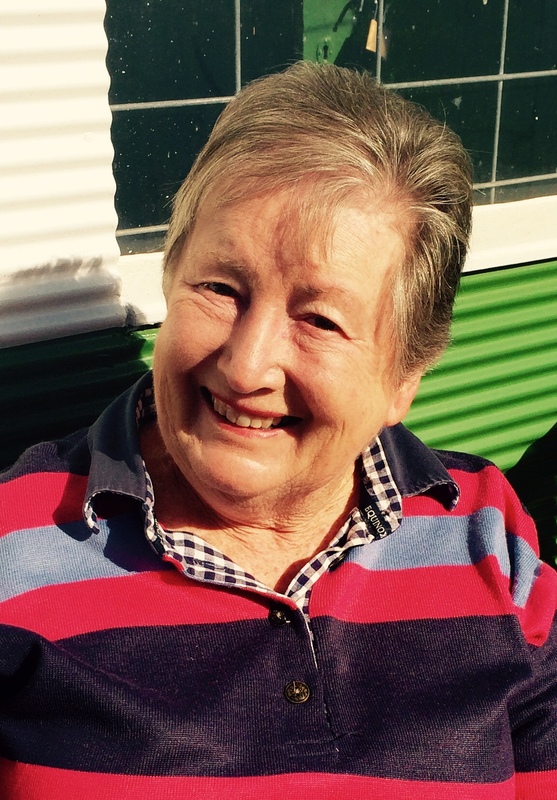 Female Team: Di Helier (Vice Captain), Leah O’Neil, Virginia Arney, Pauline Walkom, Mary Bishop. My local Mount Barker Croquet club in the Adelaide Hills was proud to have one current member (Pauline Walcom), and two former members (Greg Rowberry and Dwayne McCormick) selected in the South Australian Team. The name Eire Cup commemorates Irish-Australian croquet duals early in the twentieth century when Dublin was regarded as the home of modern croquet. In a one-off tournament in 1937, the Australian team prevailed over the Irish, qualifying them to retain one of the four Eire Cups for domestic competition in Australia. This address a year ago tells the full story of the origin of the Eire Cup,. I was immediately curious to know why a trophy with an Irish name has come to hold pride of place in an Australian national competition. My curiosity only deepened when I learned that the inscription on this beautiful bowl actually reads ‘Irish International Eire Cup’. As a former career diplomat, dedicated to promoting greater international understanding and harmonious relations between different countries and cultures, and also knowing of the penchant of Australians, including Australian sportsmen and women, to ‘souvenir’ items when traveling abroad (remember Dawn Fraser and the famous incident of the Olympic flag she stole from outside the Emperor’s Palace in Tokyo?) I was a bit worried that the Cup’s presence in Australia might involve some similar shenanigans or ‘high jinks’ that could strain our relations with Ireland, but no – obviously there are no larrikins among croquet players (!) – and the Cup, I was happy to find, travelled to Australia not like that famous flag, tucked inside a track suit, or under a croquet club jacket, but in a totally legitimate and proper way. It was won in Dublin, Ireland, in 1937 by an Australian team and was carried proudly back to Australia and stored at the headquarters of Croquet Victoria. (I thought that might have been because Victoria was the home of the first State Croquet Association, but actually the very first Australian State Association to be formed was in Tasmania in 1908, also, interestingly, the first place where the game was reported as being played in Australia, mentioned in the Tasmaniaalch’s Literal Intelligencer” in 1861; the Victorian Croquet Association was the second to be formed, in 1914, so I can only assume that one or some of the members of that winning Australian team were Victorians). As far as I can establish, the Cup was first awarded in interstate competition, in Sydney in 1942 – still presumably being looked after by the Victorians. Then, when the Australian Croquet Council was formed in 1949, the Cup became its property and has been presented, on behalf of the ACA ever since, as one of the sport’s most prestigious prizes. The prestige it enjoys today attaches to the skill of the teams involved. This is Association Croquet at its best (strategic and technically challenging), but the Cup does have added significance, I suggest, because of its history – not so much its history here in Australia, since 1937, but with Ireland and its connection to the historic Carrickmines Croquet and Lawn Tennis Club in Dublin, considered by many to be the worldwide ‘home of croquet’. Whilst purists might dispute the claim, tracing mallet and ball games back to the Middle Ages, Ireland firmly asserts its place as the location where modern croquet was invented in the 1830’s and the Carrickmines Club, founded in 1903, as the leading venue for international matches and larger tournaments. The Eire Cup was introduced at Carrickmines in 1928 to celebrate a Mrs Wilson, who had spearheaded the group that had established the club twenty-five years earlier. They must have been well-financed at the time – or in an especially expansive mood – because they ordered four identical, handsome cups, three of which are still competed for in Ireland – and the fourth is right here, thanks to that 1937 match between Australia and Ireland being declared a ‘one-off’, with the winning team able to retain the trophy. I suspect the Irish might regret that decision, but their loss was our gain, and continues as such to this day. The Interstate Eire Cup is played yearly between all of the states of Australia. The destination is different each year with all states taking a turn in hosting the event. This year the event was held in Sydney. selected as the team to play consists of 4 men and 4 women each day. The SA team takes an extra woman and this allows a day of rest for each woman. This is because the women’s game tends to go for full length of time, which is three hours, whereas the men’s game tends to be finished much quicker. The final team is selected late in the year and then practice begins in earnest. The competition consists of a mixed doubles match and then 2 singles for each player. The time limit for the games is 3 hours. This makes for some very long days. We headed to Sydney in March and it was great that we could all be accommodated at the same venue, the Sebel in Chatswood, Sydney. This venue was very convenient for all of our matches, 3 at Mosman and 2 at Chatswood. The evening before the event started we were welcomed to Sydney and the event by the Mayor of Chatswood and all enjoyed the ensuring cocktail party, with players who had represented the state before catching up with old friends, before competition started the next day. An early start was essential each day as matches commenced promptly at 8.00am and any practice on the lawns before this time. Our first match was at Mosman against the very strong Victorian team. We left Chatswood at 7.15 in a 10 seater taxi and marvelled at the traffic in Sydney. We won quite a few games on this day and this was a big improvement on previous competitions. 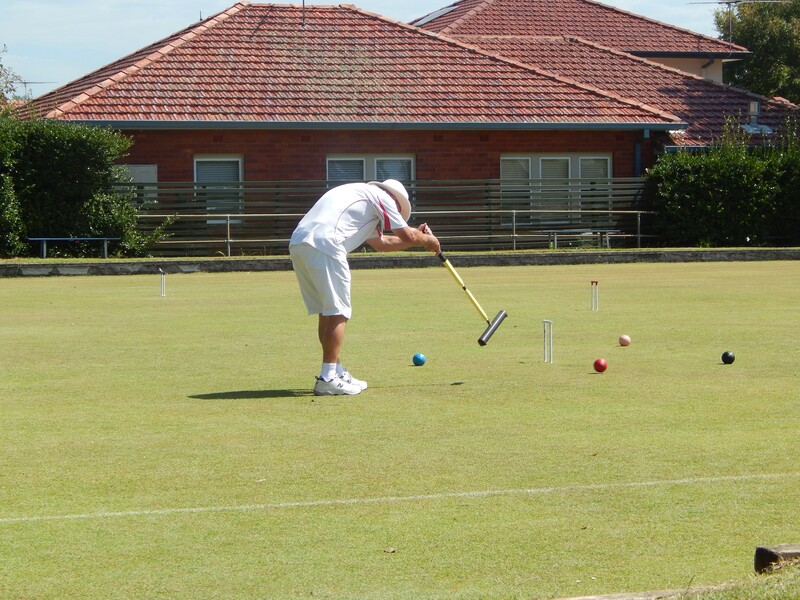 The lawns and the venues were magnificent, as was the hospitality of the Mosman Croquet Club. The next day we competed at Chatswood and Killara (each venue only had two lawns) against Queensland and were victorious. This was a great result as SA had finished last the previous year. Friday saw us at Mosman again competing against WA. Another good win to SA. Saturday however was a different result with SA going down to NSW. It was not a “whitewash” however and the players were pleased to win several games against this very strong team. Back at Mosman on the last day of competition saw the team defeat Tasmania and finish third in the Cup behind NSW and Victoria. The last night we travelled to Darling Harbour for the presentation dinner and this was quite a thrill to travel by train across the bridge and see all of the lights of Sydney. The harbour was spectacular at night and we really enjoyed the other players and the great meal. The event was a really great experience and the team combined well both socially and during competition. Each night the team went out for a meal and relaxing time together and this helped with the cohesion of the team. Monday morning saw us packing up and a very tired team returning to Adelaide. A great experience and some new friends made. 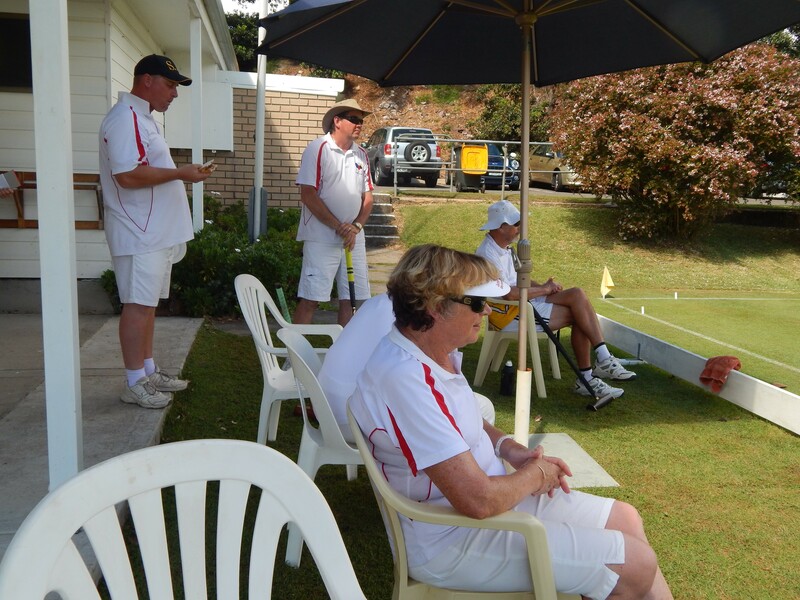 SA players L to R: Harley Watts, Dwayne McCormick, and Di Hellier at Mosman Croquet Club. This entry was posted in Croquet, Health & Lifestyle and tagged Carrickmines Club, Croquet, Eire Cup. Bookmark the permalink. ← The meanings of Easter!